The kolam as the name indicates in Tamil is pattern. The art of drawing patterns using a variety of media like vegetable and mineral pigments, rice flour, coloured powder, coloured rice etc is a popular folk artform done in all traditional Indian households. Kolam is drawn on the floor and walls. Drawing rice flour kolam at the entrance of Indian homes is a daily affair. 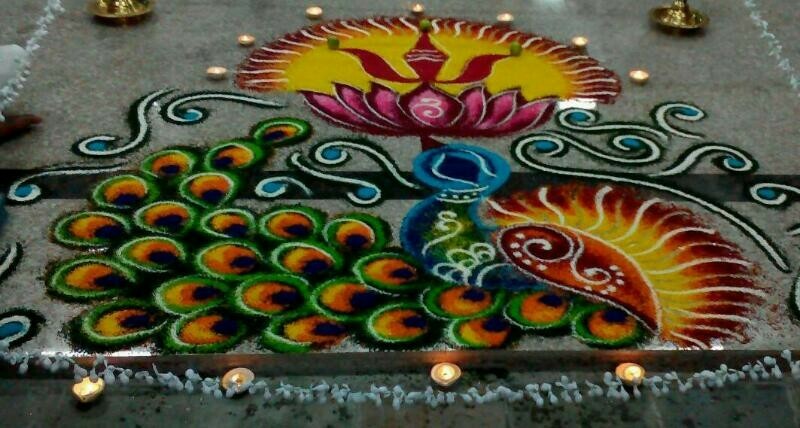 The rice in the kolam is meant to feed ants and other lifeforms in the ground. Large kolams are drawn as part of the ritual decorations during Hindu religious festivals which are regularly held to appease nature, her celestial guardians and all denizens of the world. M. Mogan is a popular free style kolam artist based in Kuala Lumpur, Malaysia who is seeked out by individuals and corporations to draw kolams for weddings, temple rituals and occasions like Deepavali and the Ponggal harvest festival. Mogan’s kolam pieces are unique as he works spontaneously and does no pre-sketching or planning however large or complex his creations are. Contact Mogan at no: 016-6176765 or leave an SMS.